About MME ď&#x201A;§ MM Enterprises is an ISO 9001:2008 Certified Company ensuring the quality of services we offer. MME offers complete support to the clients for meeting its recruitment, payroll outsource and other customized HR Services requirements. The package includes handling comprehensive features of the profile from Sourcing, Selection, Short listing, Interviews, and Recruitment. ď&#x201A;§ We deliver quick and painless HR services to companies in multiple domains and hassle-free induction of new employees. With a team of skilled and passionate HR professionals, understanding client requirements in depth is a day to day task for us. We recognize that each organization has unique needs and we design solutions as per that need. 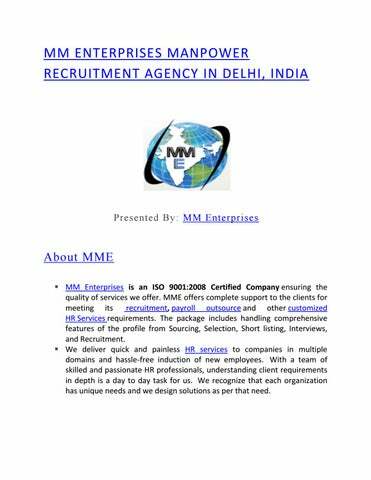 MME HR and Staffing Services:  MME is one of the leading HR solution provider company providing services for the Executive Staff Recruitment, Top Management and professionals recruitment, Payroll Outsource Services, International Recruitment, and other HR management solutions globally. 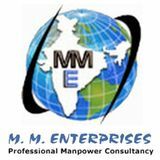  MME is an ISO Certified Delhi based HR Consultancy dealing with the top 500 companies in India and overseas as well. The employers worldwide are counting upon our expertise on hiring the befitted candidates for their companies. We perfectly apprehend how significant the role of manpower is in any company or business and accordingly fill various positions in the companies.